It’s just dirt, right? If you are planning to purchase a property or build a new home or business, the type of soil you have may bring your plans to a halt. Proper planning requires verification of soil types and conditions. Rocky soils, high water table or shrink swell soils could increase the cost of your project by thousands of dollars and require an Alternative Drainfield System or Engineered footers. 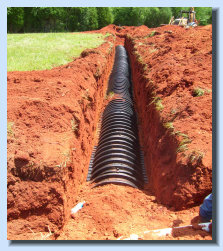 Acres of Virginia Inc. can help you determine the right course of action to accomplish you project or purchase. As well as the Commonwealth of Virginia, North Carolina and West Virginia.
" Thank you for all the work you do for Habitat. Our success in accomplishing our mission to eliminate poverty housing in Lynchburg is due to the support of folks like you and your staff"
" I and the rest of the Sports Complex Committee greatly appreciate the time and effort that you have given towards this project. It is obvious upon review of the plans that this was a significant undertaking and that it was done with great attention to detail. Please accept the gratitude of the committee and myself for your hard work"